The 3-hour train journey from Nanu-Oya to Ella, in Sri Lanka, is supposed to be one of the most scenic and beautiful journeys in the country. During the journey the train goes passing lush greenish tea estates, many tunnels, farming fields, villages & various types of forests. There is an endless stream of food and tea sellers walking up and down the train selling delicious Sri Lankan snacks – so you won’t starve. 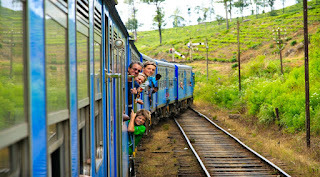 This route is very popular with tourists and travelers and is one of the highlights of your trip to Sri Lanka.